What follows may or may not be actual pages from the diary of a Calvin Abueva hater. 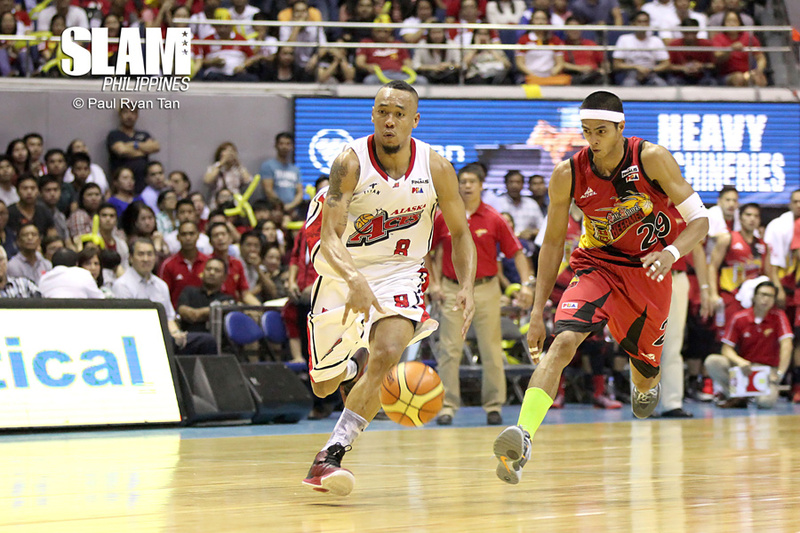 As we entered the San Juan Arena, the atmosphere was subdued. That’s what happens when a Final Four contender is beating the league’s worst team by 16, early in the second quarter. I’m amazed by fans that still support their team despite almost certain defeat. Sure, some are here because PE units are just an NCAA ticket stub away from being credited, but then I do recognize myself in some of them: loud, passionate, brimming with school spirit. Only their team never wins. Must be tough. I try not to concern myself with the distractions of this drubbing and wonder about our game. Yes, OUR game. I’m part of the team. My bleacher buddies and me are part of the team as much as, maybe even more, than the freshman point guard who we never field in. In this war, we are the archers on the top of the wall, raining down boos and cheers, keeping the enemies at bay, distracting them from the hand-to-hand combat on the floor. On this particular day, we prepare with a little more focus. After all, our army is trying to slay the Beast. 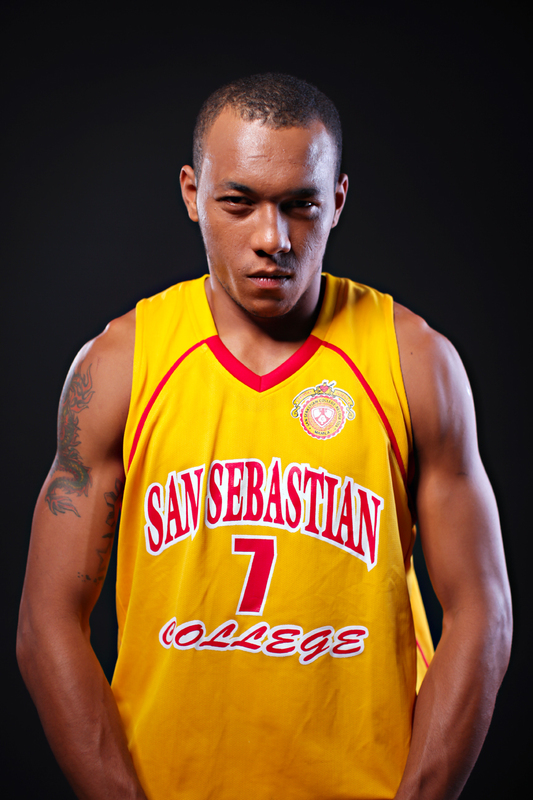 Calvin Abueva. Tss. San Sebastian’s biggest name since Saint Sebastian himself. Some people called him the most complete player in all of college. I laughed when I heard that one. Some said he was already PBA-material. That made me chuckle. Some even went as far as to proclaim him the best talent in the draft pool. That one was so ridiculous it actually upset me more than usual. I don’t like him. Why? Is it because we find it so hard to beat them? Possible. Is it because he is the person that he is? Definitely. Have I met him, ever said a word to him, hear him say anything other than a complaint to a referee? Not yet. Have we had any sort of interaction to have a fair chance to gauge his personality? Well, technically no. But I’m sure I won’t like what he has to say anyway. Game starts, game ends. Baste wins. Abueva finishes with 23, 13 and 8. Chamba. Pretty much his season averages, sure. Pero chamba pa rin yun. This was a good day. Stags lose! 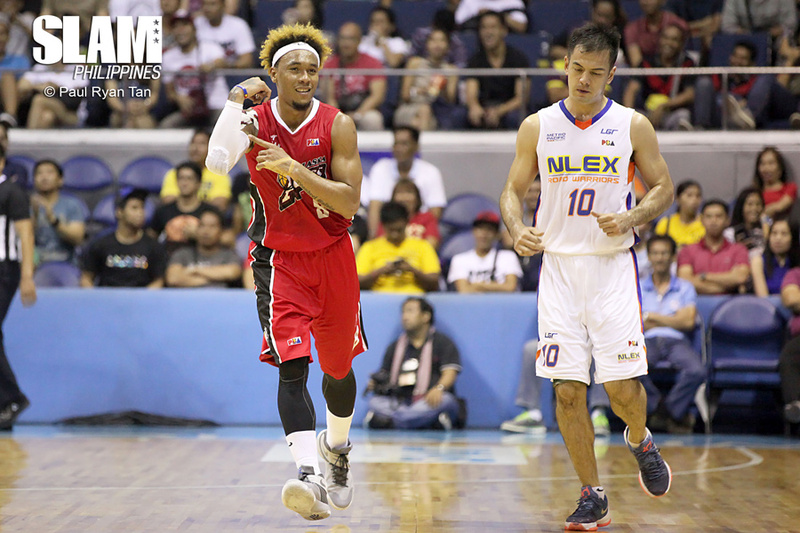 More importantly, Abueva loses! He’s done! No MVP trophy, because after he got ejected in that Lyceum game, he got disqualified from all awards. Buti nga. He got tossed from the game after what sportscasters are calling a “controversial” call. Yeah right! The NCAA is a highly physical league. Some hard fouls are just too much. Especially if they’re from Abueva. I didn’t see the play per se. The sportscasters say it was more of an ill-timed incidental contact that looked worse than what it actually was. I’ll take my friends’ word for it. They said he punched a dude in the head. Tsk. Disappointing for an MVP candidate. No Finals appearance for him too, which means no championship in his final year! I’m so happy. I’ll never see that wide, mocking grin again. You know, the one he puts on after he snags a rebound away from someone 6 inches taller, brings the ball down the length of the floor, speeds by faster guards, attracts the defense and then finds an open teammate with an assist for an easy lay-in? THAT smile. With the occasional tongue wag. I hate that smile. I don’t even get what he’s so happy about. I bet it’s just a coping mechanism. Our heckling and our jeering is affecting him, offending him and bothering him. He’s only smiling to hide the tears. Yup, that’s it. Well he’s not smiling now. His NCAA career is done. Finished. Over. No trophy, no celebration. Go take that lonely walk to the dugout. Go to the PBA already! It’s time to pay your dues as a rookie on that bench! I don’t care if he was the second overall pick. Alaska’s a struggling team, sure. But with Dondon Hontiveros and Cyrus Baguio at the wings? And the fact that he’s almost never played the guard position? Abueva’s got no chance at cracking that rotation on a regular basis. There’s no way he’ll continue to play power forward in the PBA! His game will never. Translate. In. The. Pros. Tapos na maliligayang araw mo! My dad wants to watch this game. I don’t. But I need to borrow the car tomorrow so I’m desperate for some fatherly bonding to get on his good side. He tells me he’s curious to see how Abueva will do against Petron. I laugh and tell him Abueva probably won’t even play all that much. My father. The traitor. I drop the laptop and now I’m fully locked on the TV. I may not be able to answer back to my Dad, but Abueva’s benching, or terribly ineffective game, or failure to adapt to the pro style of play, will prove my point. I can’t wait. Just wait and see, Dad. Just wait and see. Crap. Crap crap crap!! I hate it. He got lucky again! 27 minutes. 12 points, 16 rebounds and the victory. I can already imagine the sportswriters tripping over themselves just to get an interview. The voices from the screen are in mid-sentence, saying things like “real deal” and “not just hype” when my father gets up from his seat and taps me in the head, shaking up my hair, with a soft, sarcastic giggle. I hate it when he does that. “You’re so silly. I’m right. You’re wrong. Told you so,” his fingers screamed into my brain. I don’t respond. Forget the car. I’d rather walk than ride in an Abueva fan’s vehicle. “I haven’t been watching any basketball, I’m on full sembreak mode!” I’ve said that to at least 5 different people. On Facebook, Twitter or even in person, these “friends” of mine inexplicably feel the need to let me know how Calvin Abueva has been playing. There’s always a tone in how they say it, even when it’s a digital message. I can hear it so clearly, that irritating intonation. As if they didn’t hate him just as much over the past 4 years. Bandwagon jumpers. Pathetic. The truth is though, I have been watching. I’ve been reading, listening, looking closely at Alaska’s last couple of games. Judas, which is what I now call Dad in my head, caught me once, and half laughingly said “O, akala mo ba ayaw mo kay Abueva, bakit ka nanonood ng Alaska?” I tell him I’m just channel surfing. Of course, he doesn’t believe me. 16 and 12 against Air 21. Alaska wins. 19 and 9 against Ginebra. Alaska wins. All this in only 25 minutes of action on the average. So what? I enjoyed that Ginebra game though. 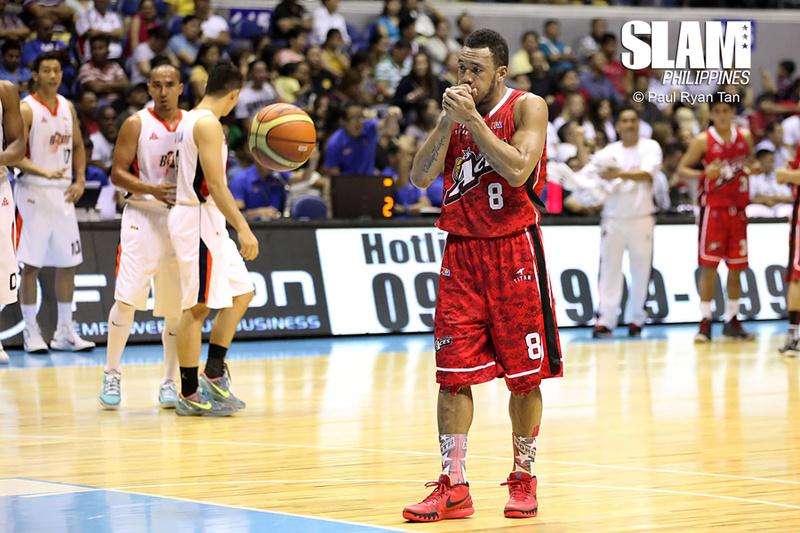 Abueva wasn’t able to get a double-double. I told you he wasn’t going to be able to do what he did in college! I’m seeing more and more of him on Twitter though. Even from respected basketball fans and analysts. This is getting out of hand. People are now talking about him being rookie of the year. ARE THEY INSANE? What about Hodge? Or Ellis? Or Mandani? Give Fajardo a chance to come back! Heck, give it to Gian Chiu! Anyone but Abueva. He doesn’t deserve it at all. The TV broadcast panel dutifully reminds me that entering tonight’s Talk N Text game, Abueva is averaging 15.6 points and 12.3 rebounds. Don’t they see that’s only because he hasn’t been scouted yet? People can be so blind to the simplest things, sometimes. Well tonight they’ll really see. Talk N Text is the league’s best team. Norman Black is an outstanding coach. He’ll know how to stop this lucky streak of Abueva. Finally, the madness will end. For the record, Jvee was the hero here. Not Abueva. Casio took the big shots. Casio helped Alaska win. Not Abueva. Abueva wasn’t even there for the end! He fouled out! That just goes to prove that he can’t play defense in the PBA. Plus, he failed to get a double-double again! Ha! I told everyone this would happen. His final line was 14 points and 5 rebounds. I don’t know why they’re making such a big deal about his 4 assists, 5 steals and 2 blocks. Those other stats don’t really count as much as the others. I think I missed it in last night’s coverage because I was manually tallying his stats (as usual) to make sure the PBA didn’t make a mistake and accidentally bloat his stats for effect (which I’m confident took place in the NCAA). But Player of the Week? Abueva? WHAT?! Has this league lost its mind? Giving it to a rookie? A rookie who just managed to be lucky? I mean, sure Alaska went on a little run, but come on! I was so upset about reading this on the internet that I couldn’t handle it anymore. I went off on Facebook and on Twitter, looking for people who would get on my side and see how wrong this was. By doing that I also proved that I need to unfriend some people and make my Tweets private. People got on my case accusing me of being a hater, saying I was just envious or bitter. Maybe they were starting to think (and this was the worst of all) that I was doing my very best to cover up the unthinkable: that I was actually an Abueva fan. Of course this just lengthened the discussion. People allowed their faulty logic and shallow understanding of basketball and of me, to take over. Someone said he could read box scores too. Even my cousin from Cebu said he was a stat geek as well. They all claimed to know more about basketball than I do, and that Calvin Abueva was some unique talent the PBA doesn’t always see. Oh please. The comment thread had gotten too long. So I took to my blog and posted the link everywhere. As for all this success in Alaska, did you guys not see how he missed out on a double-double TWICE? He’s too short to average double-digit rebounds for his entire career. He might have done it in college and is doing it now but it won’t last. His shooting is suspect. Most of his baskets just come from momentum plays and hustle points. No way he keeps that up for an extended stretch. He’s already defied the odds by doing it this long. It’s just a matter of time before this statistical anomaly corrects itself. I guess I got my point across. Win! All the comments that followed were just versions of “Hahahahah Tito Robert!” or “Fail” or “This is just sad.” Yeah, I kind of felt bad I embarrassed my dad like that and now people are laughing at how wrong he was about Abueva. I guess the truth hurts, and maybe that’s why it’s so hard to see, even when it’s staring you in the face. 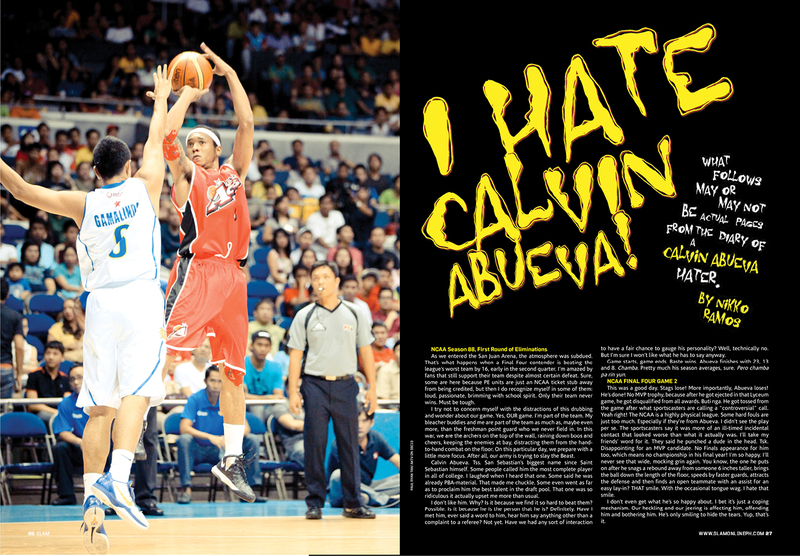 What I do know is that I am not a Calvin Abueva fan.